Thesis Laboratory is a place created to provide skins, boxes, helpful tutorials and support for the WordPress, Thesis community. My new skin, “EDDIY” integrates with Easy Digital Downloads! What is Thesis Laboratory All About? 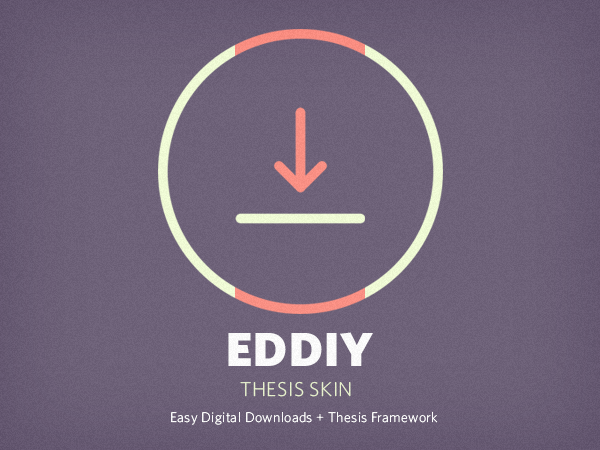 Thesis Laboratory offers premium skins with beautiful design & functionality. Skins include built-in boxes, widgets, templates, icons & more! If you aren’t looking for a skin, we also offer Thesis boxes. Boxes are built with the latest coding standards and they will work with any Thesis skin. In addition to our downloads, we try to provide a valuable blog with tutorials for Thesis designers & developers. All articles are free to distribute. Our skins are built with ready-to-use content sections so getting started is a breeze. Most features require nothing more than checking a few boxes or entering some text. No matter what type of device your website is being viewed on, it will look great. With the ever-growing popularity of mobile & tablet reading, this is an important topic. All skins & boxes have sections on the support forum for customer questions and collaboration. Documentation is also included for all products (currently in progress). 14 premium boxes, five page templates and two WordPress widgets (included with each skin) allow for a limitless array of website layout, design and content possibilities. Purchase a single skin, all Thesis Lab skins or just grab the free stuff. This section includes any skins or boxes Thesis Laboratory offers free. Purchase any skin individually for $27 – We currently offer the Criss Cross skin. ALL SKINS & BOXES will be available to purchase at a one-time discounted fee!